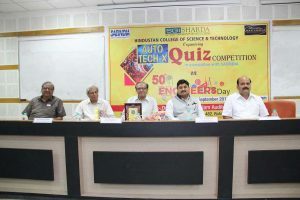 50th Engineers day with the theme “Role of Engineers in a Developing India” celebrated by Hindustan College of Science and Technology on 15th September 2017 at Ground Floor Media Centre commemorating the birthday of one of the greatest engineers in India so far and a great human being “Bharat Ratna” Sir Mokshagundam Visvesvarayya, popularly known as Sir MV. 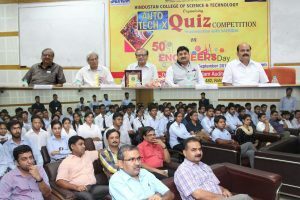 On this occasion a quiz competition named AUTOTECH-X is also organized by second year members of collegiate club of S.A.E. India in which 200 students of different near by colleges have participated and make it a great success. Dr. Rajeev Kumar Upadhyay, Director, HCST, Mathura gave welcome speech in which he also paid homage toSir M. Visvesvarayya. He said that Sir MV worshiped all of his work and achieved great success and we all must learn this quality from this great personality. Prof. V.K. Sharma, Executive Director, HCST, Mathura congratulated all engineers on this occasion and inspired to work towards the progress of country. 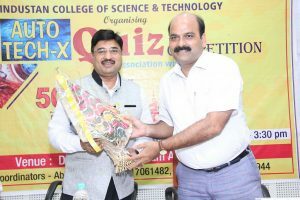 Mr. Pradeep Mahtha, Executive Vice President, SGI discussed the qualities that an engineer must have and focused on the opportunities after technical education. Ex-Chairman & Managing Director, Celestial Knits & Fabs Pvt. Ltd.
Vote of thanks was proposed by Dr. Y.C. 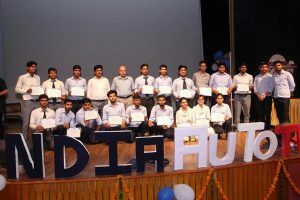 Dhote, HOD, Automobile Engineering, HCST, Mathura. All Deans, HODs, Faculty Members were present on this occasion.